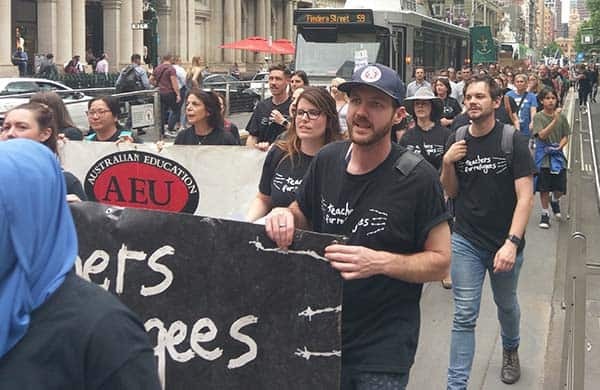 A fantastic 200 teachers from more than 50 schools across Victoria, and 150 teachers from 20 schools in Brisbane, walked out to protest against the offshore detention of refugees, yesterday. 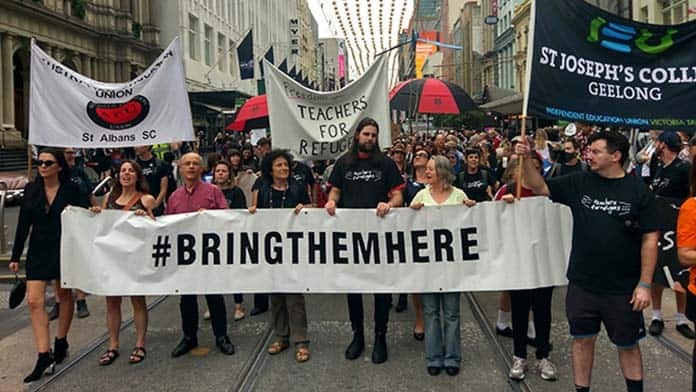 The atmosphere was charged with excitement as teachers, plus hundreds of supporters, filled the State Library forecourt in Melbourne to demand the government bring all kids and adults off Nauru and Manus immediately. Some teachers had organised large contingents from their school. Nine out of 13 teachers walked out together at a Brunswick public school. Yeronga State High School in Brisbane had 47 teachers walk out! Others had travelled from hours away, giving interviews to regional media outlets about their involvement in the walk-off before they left. There were union sub-branch banners from every stage and kind of school. Some arrived in smaller groups, representing many more who wanted to come, but whose principals had obstructed them. Some teachers arrived on their own, but no one could have left feeling isolated. The hundreds of teachers in Melbourne were surrounded by hundreds of others in contingents from the union movement and the refugee campaign. Unions there in support included the CFMEU, HACSU, NUW, MUA, NTEU, VAHPA, ASU and ANMF, as well as contingents from Grandmothers against Detention, Rural Australians for Refugees, Labor for Refugees and Refugee Action Collective. The support of the union movement has always been an important part of the refugee campaign. But the two-state walk-off off was a significant escalation for the movement. Besides the Yeronga teachers’ stopwork action in 2015 to support their detained student, Mojgan Shamsalipoor, the walk-off is the first explicit industrial action against government refugee policy. In Victoria, a group of rank-and-file teachers, members of the Australian Education Union, took the initiative. The momentum of the #KidsOffNauru campaign set us in motion. Our union’s mobilisation of members for the Change the Rules rallies and delegates meetings meant there was a precedent for the walk-off. We collected over 70 signatures from rank-and file-members calling on the AEU to support it. As a result union officials put a resolution endorsing it at a Branch Council meeting at the end of October. The following weekend, the Queensland Teachers Union followed and passed a resolution to hold a Walk-Off for Kids Off too! Teachers for Refugees activists in Victoria used the networks we built up from the t-shirt and “selfie” actions over the last three years to contact teachers to start organising contingents. We sent out “how-to-walk off” guides, and with the support of Mums and Grandmas for Refugees we produced a letter to parents about why we were walking off, and how they could support us. We kept sending out updates, making sure teachers knew we would still be walking out even when Morrison made his announcement that the kids would be all off Nauru by Christmas—we said we want them off now, and we want all the refugees off, not just children! We knew some principals were facing a backlash from parents, or losing their nerve in the face of intimidating and discouraging department circulars, or confusing advice from the union. So we organised for parents and members of the local community to call principals to let them know they supported the walk-off. We wrote media releases, opinion pieces, and requests for solidarity from across the union movement, and got hugely enthusiastic responses, including an invitation to speak at the CFMEU shop stewards meeting. In Queensland, the teachers’ union sent an email to all members encouraging them to participate in the action. In Victoria there was not the same level of organisational support from our union, which makes the turn out even more of a testament to the level of rank-and-file organisation around refugee rights. The refugee campaign has forced Scott Morrison and the Liberals to start getting the children off Nauru to Australia. But this is nowhere near enough. The walk-off was also a warning to the Labor Party that unionists are demanding an end to its support for offshore detention. Immediately, Labor could vote with The Greens and crossbench MPs for Independent Andrew Wilkie’s bill to get the last 17 kids off Nauru along with as all separated parents, as a step towards getting everyone off. Teachers, unionists and the refugee campaign are on the offensive, and we will keep escalating until the camps are closed for good.